Honda and General Motors have officially announced that they will jointly manufacture advanced hydrogen fuel cell systems. The next-generation fuel cell systems will be used in the future products of both companies. The companies also announced that they are making an equal investment totalling $85 million into General Motors' battery plant in Brownstown, Michigan, to add a production line. The new fuel cell production line is expected to be operational by 2020 and will create around 100 new jobs. This is the automobile industry's first joint venture to mass-produce advanced hydrogen fuel cell systems. In a statement, General Motors has said that both companies "have integrated development teams and shared hydrogen fuel cell intellectual property to create a more affordable commercial solution for fuel cell and hydrogen storage systems". 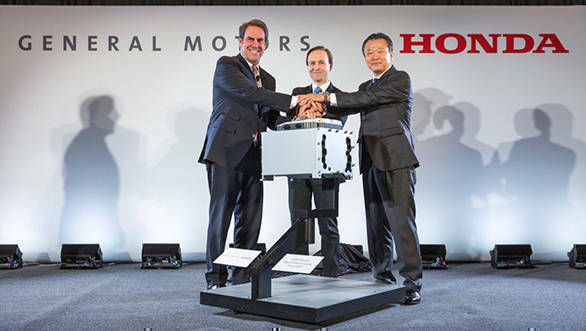 General Motors and Honda's fuel cell system manufacturing joint venture will have three executives from each company, forming the board of directors. Additionally, a president will be appointed to rotate between each company. Apart from improving the performance of the hydrogen fuel cell system, General Motors and Honda are collaborating to bring down the development as well as manufacturing cost via economies of scale. The companies have also stated that they are working with governments to improve the refuelling infrastructure which is vital for long-term success of fuel cell vehicles.